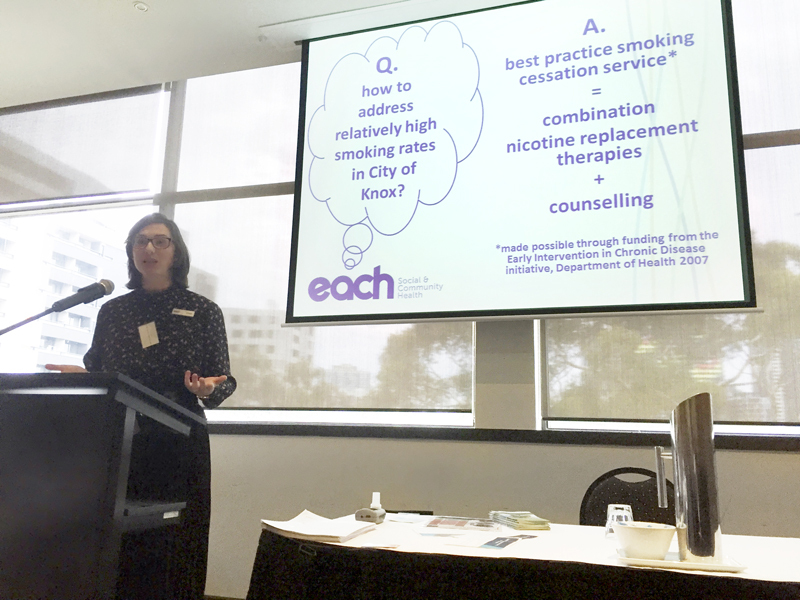 EACH’s Tobacco Free Clinic was invited to present at a Smoking Cessation Forum: High Priority Populations hosted by the Victorian Department of Health & Human Services in Melbourne on 21st April 2016. Around 200 service providers from the health sector attended the event, aimed to address best practice smoking cessation support across primary and community care settings. Our smoking cessation specialist and health psychologist showcased how EACH delivers best practice in smoking cessation support: providing counselling interventions to address emotional and behaviour connections with smoking plus monitoring of combination nicotine replacement therapy (NRT) or pharmacotherapy to address nicotine dependence. As demonstrated by research, this approach gives people the best chance of quitting tobacco. For more information on our Tobacco Free Clinic program call (03) 9757 6200 or view the Tobacco Free Clinic page here.